In this day and age, just about every single one of us carry around a portable communications device such as a smartphone, and more than that, many of us do have a tablet to augment our status as a road warrior. Having said that, there is one particularly important element that everyone should always remember – the charger. After all, no matter how powerful that mobile device can be, it will still need juice to run on, and this is where the £19.99 Chargekey yearns to make your life a whole lot better. The Chargekey happens to cater to either Micro USB or iPhone 5/5c/5s ports, where you will need to make a choice right at the time of purchase to suit the plethora of devices that you own. Touted to be the world’s most portable USB charging cable for iPhone and Android, it will be able to play nice with just about any keychain out there in the market, and since all of us do not leave our homes without our keys, then it is perfectly acceptable to assume that the Chargekey is indeed, handy to tote around. It is made from durable rubber and silicone with scratch-proof connectors, doing away with the possibility of wires getting all tangled up in your bag. 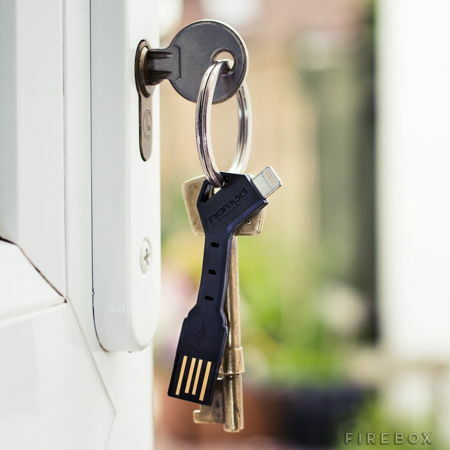 As long as there is a USB port around, then Chargekey is more than ready to charge up your device.